Linkin Park was/is one of the better bands to fuse rock with hip hop. It’s not a genre I’m in love with, but Linkin Park can pull it off. They weren’t goofs like Crazy Town or Limp Bizkit trying to prove just how much they were into hip hop, they’re really more of rock band that just happens to use beats and an emcee. The rap factor is always used to enhance the songs, not be the songs and that’s why this album works and is one of the best rock album of the early 2000s. “Crawling” is my favorite track and is one of the best “nu metal” songs ever. “One Step Closer” was the album’s first single and was pretty popular, but it wasn’t until I heard “Crawling” that I knew I had to own this album. I had bought the album around the same time I bought my first car, so I gave this one a lot of play in MY car in MY CD player with a big grin on my face. 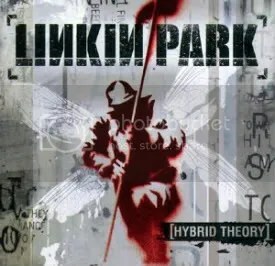 I can’t say I’m a big Linkin Park fan (their follow up disappointed me), but I’m a big fan of this particular album. The band is really good at writing great melodies to fit the angst found in the lyrics. When this album came out, Chester Bennington scored several cool points for me in an interview where he was asked about his voice — he said he got his voice by screaming his lungs out to Judas Priest in his bedroom when he was younger. The album itself was a HUGE success. It’s one of the biggest hits of the 2000s and is one of only eight albums released in this decade to achieve diamond status (1o million+ sold) from the RIAA.